This particular model is the router + wall satellite combo, which means you get one base station and one 'satellite' (basically just a less-powerful station that plugs directly into an outlet). The base station should cover 2,500 square feet, and the satellite can cover 1,500 square feet. The system with one station and two satellites went on sale earlier this month, but it was still $300. There are some other nice features too, like an app for setup and management, support for creating a guest network, content filters for young children, Alexa compatibility, and more. 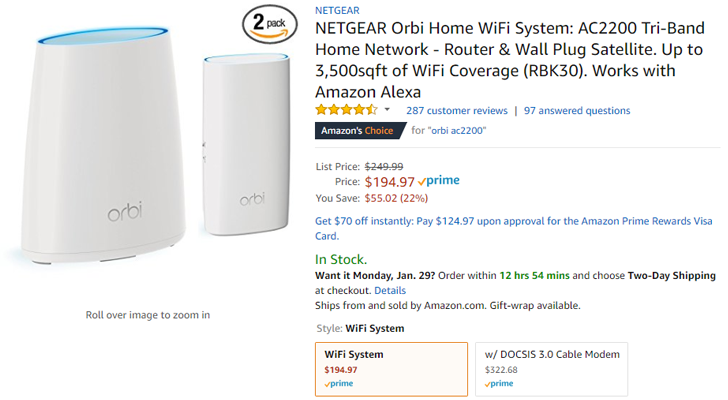 You can buy the Orbi system for $194.97 ($55 off) from Amazon at the link below. Best Buy also has it for $199 ($50 off), with in-store pickup options available.